The initial attack on the 16th and 17th of November had not gone well for the men of the 16th Infantry Regiment and the situation was looking bleak. The First Battalion was supposed to take Hamich in a single day, with the Second and Third Battalions moving on to take Hill 232, located to the north-west of Hamich. Instead, the First Battalion had almost been annihilated and had to be reinforced by the Third Battalion from reserve. At the end of the 17th of November, Hamich was still in enemy hands and it did not look as though it was ready to fall to the Americans just yet. Ammunition detonates inside a burning M-4 Sherman during the attack on Hamich, A Company, 745th Tank Battalion, November 18, 1944. Enemy artillery was falling on the GIs throughout the night and early morning hours of the 18th as the men huddled down in their foxholes, trying desperately to stay under cover. The Americans responded in kind with their own artillery. The 5th Field Artillery Battalion fired over one hundred rounds of high explosive (HE) into Hamich during the night in order to harass German troop movements within the town and soften up the defences for the next assault. As daylight broke, the First and Third Battalions of the 16th Infantry prepared to start their attack once again. At 0800 hours, they jumped off. Progress was slow and the men advanced under a withering artillery barrage. This attack brought elements of the Third Battalion to the outskirts of Hamich and at around 0900 hours they began to push into the town itself. Fierce house-to-house fighting erupted as the battalion cleared the town of enemy troops. Grenade duels and bloody melees broke out across the town as the GIs fought their way through. The supporting units had managed to join the attack on the 18th, adding some much-needed firepower to the infantry. A Company of the 745th Tank Battalion moved up the right side of the Schevenhutte-Hamich road whilst a platoon from the 634th Tank Destroyer Battalion advanced straight along the road into town. As they moved into Hamich, the TDs took one side of the street and A Company, 745th, took the other. The attack reached the center of town before a determined enemy counter-attack halted it in its tracks. One of A Company’s M4 tanks managed to knock out a German Self-Propelled Gun (SPG) at the end of the main road into Hamich. However, a German Mark V tank managed to maneuver along an adjacent street and fire through the M4’s frontal armour, knocking it out before it was able to fire again. 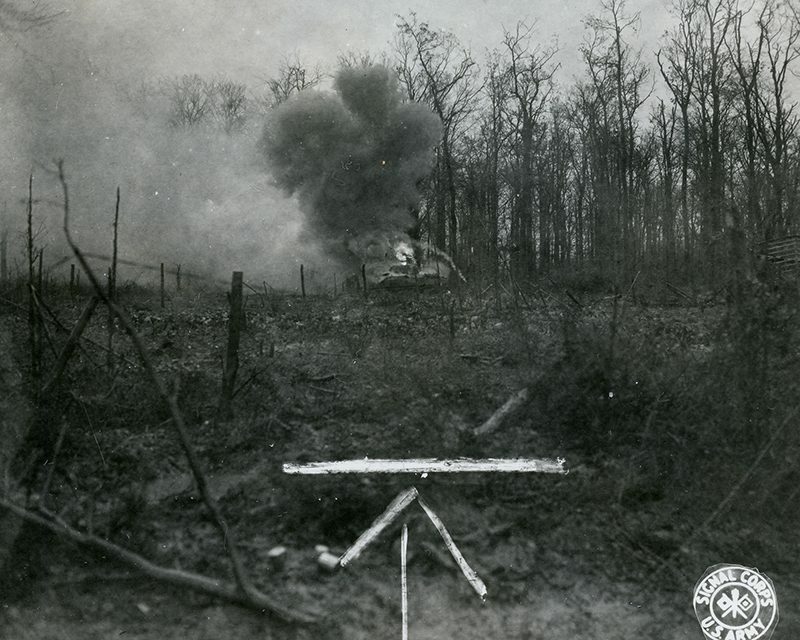 The supporting infantry of Third Battalion managed to hit the Mark V with a bazooka, doing no damage, but it was enough to make the German tank withdraw. By 0920, roughly one third of Hamich was now in American hands, the tide was slowly turning in favour of the 16th Infantry. Knocked out Sherman in Hamich, Company A, 745th tank Battalion. The surviving entered the eastern outskirts of Hamich to support K Company as they began the bloody job of clearing each house and every cellar of the defenders. I Company, down to only sixty men, followed on and began mopping up the areas of the town that K Company had passed through. However, there were still enemy infantry and a couple of tanks holding the northern sector of Hamich that were causing a great deal of trouble for the attackers. The U.S. Air Force had been supporting the attack all morning, but they soon had to be called off as the men entered town after several cases of friendly fire. After the Air Force had been pulled off the attack, the Third Battalion was able to advance once again. The infantry pushed forward towards the last pockets of resistance, entering each house after a barrage of hand grenades and spraying the ceilings with automatic fire to clear the upper floors. The supporting American armor had managed to knock out four German tanks that had been assisting the defenders to the loss of one tank destroyer and two M4 medium tanks. This left only a single enemy tank remaining that proceeded to prowl the northern outskirts of town. Hamich was recorded as ‘secure’ in the regimental journal at 1120 hours, apart from roughly five houses on the northern side of town which were still in German hands and were being supported by the last enemy tank. Further attacks were called off due to the fact that casualties had been so unexpectedly high taking Hamich, so these houses would remain in enemy hands for the rest of the day. The survivors dug in and were to consolidate their hard won positions in town. After darkness fell, the enemy launched a determined counter-attack on Hamich with around five tanks and over two hundred infantry. The attack was supported by artillery which kept the Americans pinned down as the enemy advanced. The artillery managed to destroy one of the supporting Shermans and a tank destroyer of the 634th TD Battalion. Both vehicles burst into flames, illuminating the surrounding battlefield. The forward observer attached to Third Battalion was forced to direct his own artillery battery to fire on the American positions in a desperate attempt to halt the German attack. One of the German Mark V tanks crept along an adjacent street to the main road into Hamich, barely visible from the flames cast by the burning American tanks. The Mark V got with eight yards of a Sherman from A Company of the 745th Tank Battalion. The Sherman silently lined up its shot before firing at point blank range into the turret of the Mark V, destroying it instantly. Despite this loss, the vicious assault against the Americans was making progress and the Third Battalion was forced to give up three more houses before they could stop the momentum of the attack. The men of Third Battalion were “screaming for bazookas and bazooka ammunition.” K Company was almost overrun in their effort to halt the attack and suffered heavy casualties as a result. German Mark V Panther that drove into a bomb crater during the night and rolled over, knocking it out of the fight. Four separate attacks were launched on Hamich during the night, with German and American losses about equal. At around 2255 hours, the enemy infantry pulled back and retired from the assault, leaving their tanks to prowl the streets. The German armour could do little against the Americans in the darkness, but they proved to be an unnerving presence for the GIs trapped in town. 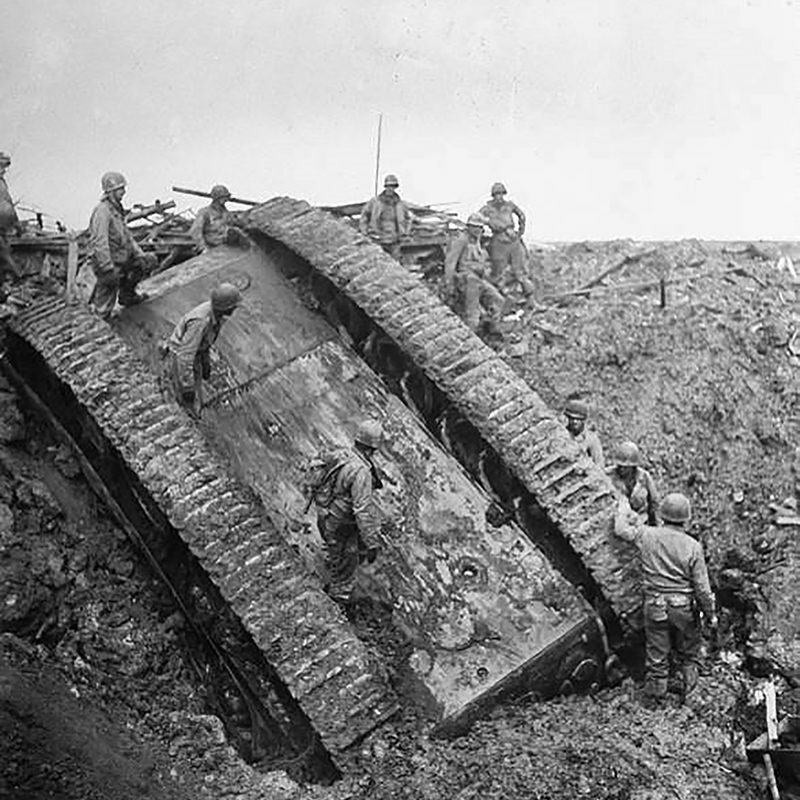 During the night, one Mark V drove into a large bomb crater and flipped over, knocking it out of the fight. Both German and American bazooka teams stalked through town during the night in an effort to knock out the other sides supporting tanks. A Company of the 745th Tank Battalion lost two M4s to Panzerfausts during the night and one Tank Destroyer was also set ablaze by enemy hand grenades after they were dropped into the open topped vehicle. Carmen S. Turchiarelli of K Company managed to even the score for the Americans after he fired a bazooka from a second story window down into the turret of a German tank. Carmen managed to knock out a second vehicle after moving into the street and firing his bazooka through the barrel of the enemy tanks main gun. Carmen Turchiarelli was later awarded the Silver Star for this action. 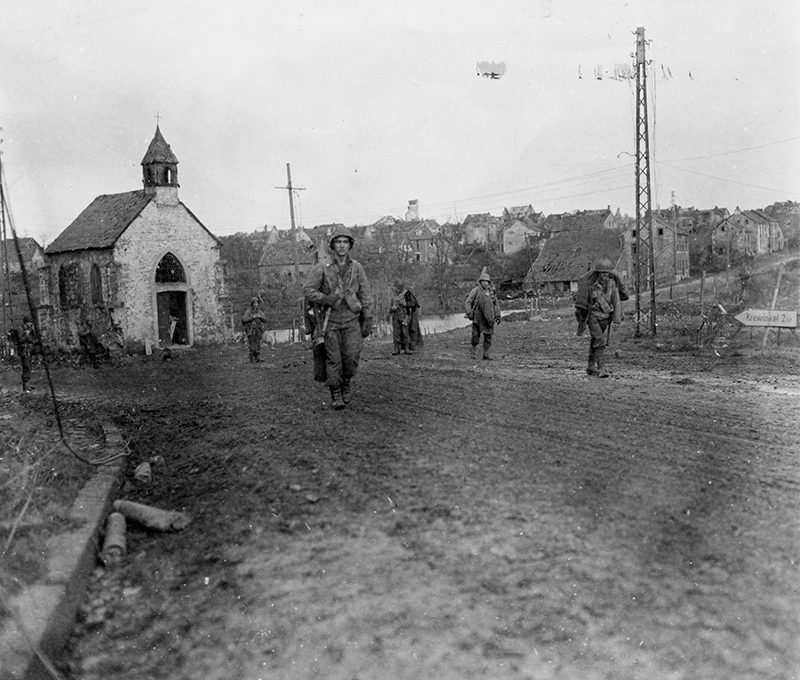 Men from the First Battalion, 18th Infantry Regiment, moving through Gressenich on November 18, 1944. After the German counter attack on Hamich had failed, the Germans began pulling back from the town and by 0800 hours, the situation was under control. Several M4 Shermans of the 745th tank Battalion, that had not entered town the day before, fired a salvo of high explosive shells with timed fuses from the woods to the south-east. These shells were aimed at the remaining enemy held buildings in the northern part of town. 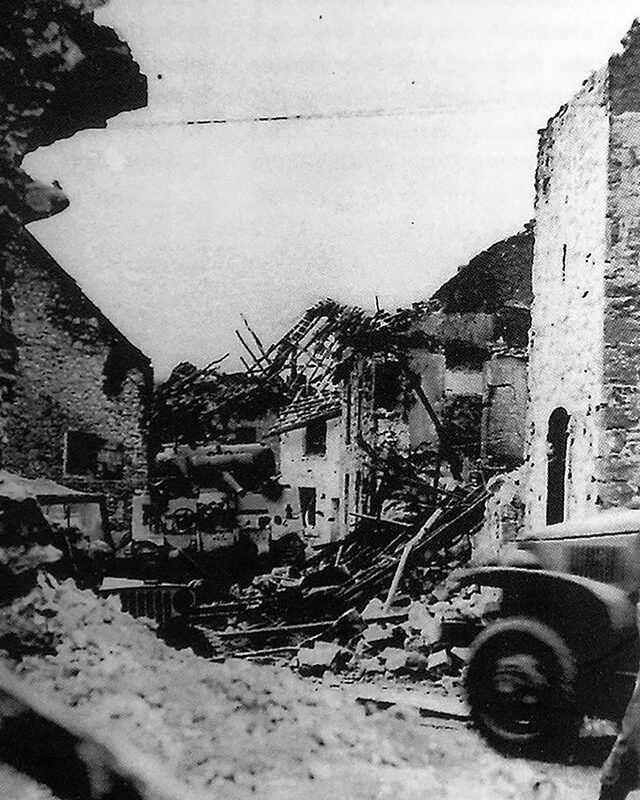 The lethal bombardment allowed the remnants of Third Battalion inside Hamich to move north and clear the last few buildings of German resistance. With Hamich now secure, the Third Battalion advanced to occupy a ridgeline north of town and held that position until the 23rd of November, during which it managed to capture roughly one hundred prisoners and inflicted serious losses on German troops. The ridge was taken with relative ease on the 19th due to the enemy forces being so depleted from their previous counter-attacks. The First Battalion of the 16th Infantry Regiment had taken severe losses during the fight for Hamich, and they were pulled off the line on the 19th of November and moved to the vicinity of Gressenich. Harley Reynolds, of B Company, produced a casualty report after the battle which stated that only 27 men were left standing on the 19th of November. C Company had suffered similar losses, starting the attack with roughly 160 men, they left Hamich with 31. In its current state, the First Battalion was effectively a spent force and could not be considered combat effective until it had been brought back up to strength. Between the 16th and 21st of November 1944, the 16th Infantry Regiment suffered a total of 906 casualties in the vicinity of Hamich and Hill 232. The attack on Hamich is considered to be one of the bloodiest engagement that the 16th Infantry Regiment participated in during the Second World War. A total of six Distinguished Service Crosses (one of which was upgraded to the Medal of Honor in 2014) and one Medal of Honor were awarded to men of the 16th Infantry Regiment for their part in taking Hamich and the vitally strategic position of Hill 232. The casualty rates and conditions that the men fought in were second only to those suffered during the invasion of Normandy. Despite this, the battle for Hamich is largely forgotten and overshadowed by the outbreak of the German Ardennes offensive only three weeks after Hamich was taken.